Say hello to our electric Edgy! The red circle sticking out is the only real sign that the bike is electrified. I should back up a bit and explain how we even got onto the topic of bikes. As it turns out, my first love for transportation is actually bikes, in almost all forms (I haven’t had much luck with unicycles). I like to recreate on mountain bikes on the weekend, but before I kept getting jobs that were large distances from my home, I also commuted to school (and later work) by bike. Given the choice, I would generally choose cycle commuting first – there is just something about feeling the elements on your face (yes, even rain and snow!) and enjoying the world unencumbered from the restrictions of ‘B’ pillars and the roofline. The bike is made by the company Xtracycle – originally they started with an extension kit called the FreeRadical that you could bolt to almost any hardtail and create what is known as a “longtail” in the world of cargo bikes. I had discovered the FreeRadical during my university days in the early 2000’s and was quite intrigued by them. I decided against one in the end because they do have a tendency to flex somewhat, and being a bike nerd, I didn’t think I could accept that compromise. Fast forward 10 years, and Xtracycle (along with a few other companies, see Resources) now builds a purpose-built longtail cargo bike. I started drooling over one in about May of 2014 shortly after moving to Nelson – then in June I came across an electrified version owned by a fellow soccer family. That looked like the ticket! I dithered over whether to get it for the rest of the summer, and whether I would electrify it, and if I did, would I get a mid-drive kit or a hub motor? (For a relatively concise website that breaks down the differences, head here. Maybe I should have got the rocket version?) Anyways, by the time I thought I had the answer, the snow was flying and I forgot about it for the winter. 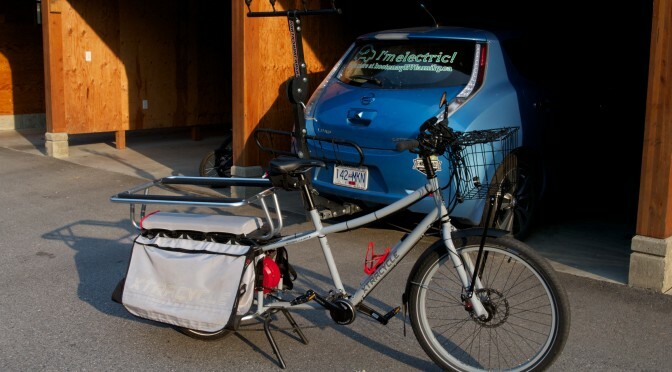 Once spring had sprung in March, I started hearing about rumours that Xtracycle was going to release an off-the-shelf mid-drive electric-assist version of the Edgerunner, and then I heard that Yuba was going to release a similar bike called the Spicy Curry; that really didn’t help with my earlier indecision! There is certainly something to be said for a purpose-built object, since hopefully the engineers have sorted out most of the potential wrinkles for you (certainly the Leaf is a very well engineered vehicle). When it came to the bike though, I’ve been working on my own bikes for the better part of 2 decades, and am reasonably sharp, so I figured I could install my own electric kit and troubleshoot any items. 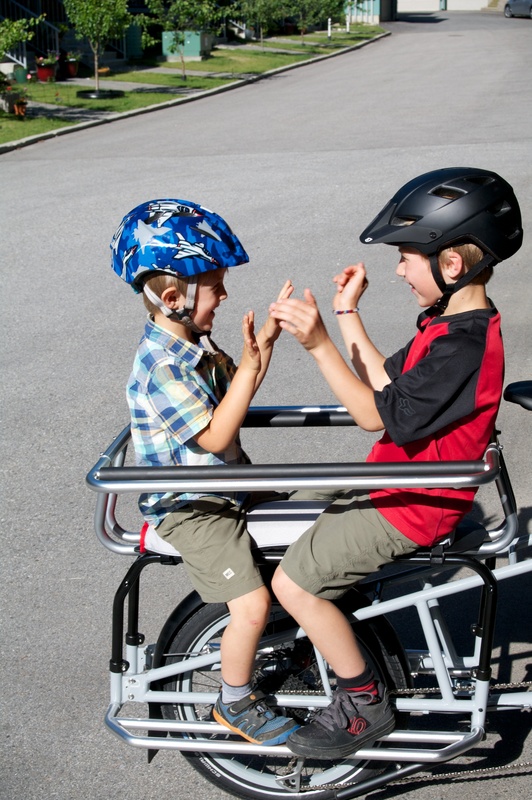 Well, that and we saved thousands of dollars by purchasing the kit instead of the off-the-shelf mid-drive bikes! We ordered the bike in May, and it showed up towards mid-June. We rode it like that for a month or so, and decided that to really unlock it to its full potential, we would definitely need an electric kit. Because Nelson is quite hilly, we decided to purchase a mid-drive kit from Grin Technologies in Vancouver. We ordered the kit, took delivery in about 2 weeks, and I spent the better part of 6 hours installing everything in one evening (it involves swapping out BB, cranks, mounting the motor, etc). After a few glitches with our initial controller, everything seems to be up and running really well now. This type of kit takes a bit more work to get the ‘feel’ that you want, but it is adjustable and uses parts that aren’t proprietary, so if you are tech saavy (or have access to someone who is!) it is a great kit. The motor mount. 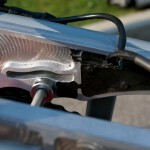 You can also see the cadence sensor bracket on my left crank-arm. Looking at the driveline side – the red motor is actually a hub-motor! It pulls the chain from cogset; my torque pulls on the motor attached to its bracket. The rear rack, bags, and Hooptie all fit over top and hide the underlying kit almost entirely. 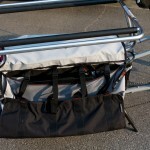 If you don’t have a Hooptie, the battery can actually mount on a custom rail underneath the load-deck and above the motor mount – it is pretty slick, but the two bars that come out of the front of the Hooptie preclude its use, so we have just put it inside the Xtracycle bag. (which itself is quite water-resistant). You can also see my crankset is a Patterson Transmission, which has a 1.65 overdrive (so I still have two gears on the front) – this crankset freewheels and comes with the kit. We purchased a 48 V system with an 11 Ah battery, so we have about 500 Wh to use, or 0.5 kWh. Our car has a 24 kWh battery, of which about 20 kWh is still usable, or about 40x the capacity. The Leaf has an 80 kW motor, while the motor on our Edgy is 0.75 kW; weight of the Leaf is 1,500 kg, with me and the kids added, up to 1,615 kg; weight of the Edgy is around 30 kg, add me and the kids to get 145 kg. Power to weight ratio for the Leaf is ~55 W/kg; the Edgy is only 5 W/kg! Needless to say, the Leaf vastly out-accelerates the Edgy. I’m still quite impressed by the load the Edgy can haul up quite a steep hill however. So far efficiency has been reported ~ 10 Wh/km around town using moderate assist; I’ve seen consumption as high as 18Wh/km after climbing 350 m in about 7 km. How does this compare to the Leaf? 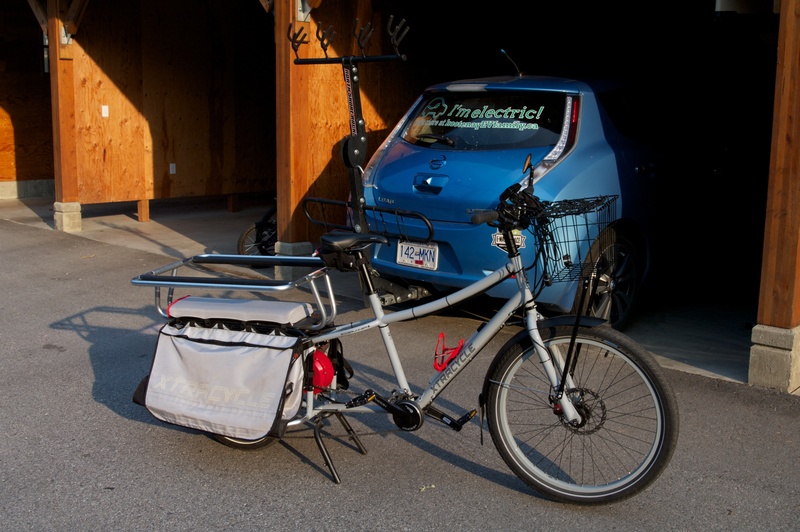 I’ve been averaging about 6 – 7 km/kWh; so converting this to compare to the e-bike, that is about 165 – 140 Wh/km. Surprisingly, given the bulk and power of the car, it does quite well in comparison at only 9 – 14x the energy usage. However, for shear cost to operate, the electric bike comes out well ahead at about $0.10 per 100 km of riding! One other slick thing about this kit is the optional upgrade to the battery charger (the Satiator – instead of a ‘dumb’ wall unit that only charges to 100%, this one can be programmed to have almost any charge profile you like! They preloaded mine with a standard 100% charge, a ‘fast’ 100% charge, and an 80% charge. I have been using the 80% charge option so far, and only plan to use 100% when we intend to go for a long bike ride and push the range (e.g. 50km). What is it like to ride? Once I had the system set-up to my liking (and I’m still tweaking it a bit), it has been quite awesome! Proportional assist is fantastic, and I use it sort of like a gear – on the flats just cruising, I run it on the lowest setting. Up a slight incline or going fast on the flats, I use it in the mid-setting. On big hills or to get up to speed I flick it to the maximum setting. It’s amazing how easily this bike makes really steep hills turn “flat” when using an easier gear – I’ve taken both boys on the bike (an additional 100lb) up a 15% grade without issue at a steady 8 – 10 km/h. The big thing to remember is not to shift into a harder gear when the motor is contributing greater than about 250W (easily read on the main screen). Shifting into an easier gear can be done up to about 500W. So really what you have to do is anticipate what gear you might need to be in for a hill so you can avoid shifting under power. Just like riding a bike for the first time with gears though, you get used to it fairly quickly. Check out this awesome blog called “Hum of the City” – she has tested numerous cargo bikes, some electrified, some not, and her family has been living a car-free existence for several years now. 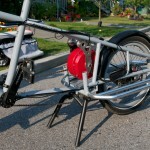 electricbikereview.com and electricbikereport.com are two good websites with reviews and news for e-bikes. Hi, did you end up buying the 2015 edgerunner frame, or did you get an older model? I have v2 from 2013, which I am considering electrifying if we move to Nelson. Hi Lise – we have a 2015 Edgerunner. 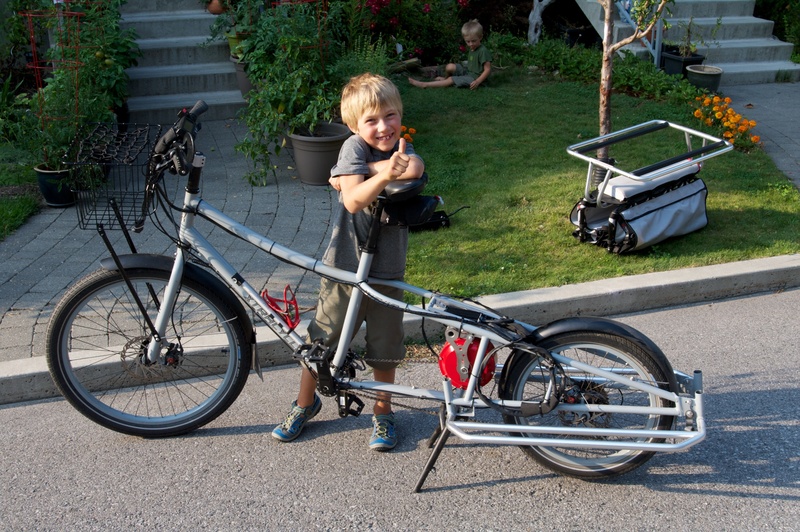 I’m not sure if that is the same frame as your version from 2013 or not – you might need to call Xtracycle to ask. 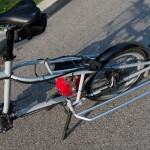 Ebikes.ca (Justin) would also know if the adapter I have in my kit would also work for your bike.